CheckedOK Helps Safety Inspection & Asset Management. ESB Networks Ltd. handles the construction, operation and maintenance of the electricity network in Ireland. It manages the network, providing services to all electricity customers in the Republic of Ireland, irrespective of their electricity supply company as part of the 7200 employee ESB Group. ESB Networks is responsible for building, operating, maintaining and developing the electricity network. This includes all distribution stations, overhead electricity lines, poles and underground cables used to bring power to more than 2 million domestic, commercial and industrial customers nationwide. Maintaining safety inspection and managing assets are important parts of the ESB Networks business. To help improve the processes used, ESB chose CoreRFID and the CheckedOK inspection system. ESB Networks is responsible for almost 600,000km of power transmission and distribution cabling as well as the 600 transformers and substations needed to provide power across Ireland. 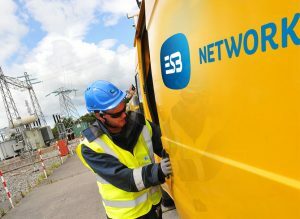 To carry out routine maintenance and emergency repairs, ESB Networks has a team of engineers, operating in its distinctive fleet of yellow vans. Vans are equipped with all the equipment needed to gain access to and repair the network infrastructure. ESB Networks staff use a wide range of lifting, climbing and working at height equipment to help them keep the distribution & transmission network running. Maintaining this network often involves ESB Networks engineers in lifting operations, climbing and working at height. Ensuring safe maintenance operations is a priority for ESB Networks and activities have to conform to the country’s safety legislation. Inspection and overhaul of lifting and climbing assets is an essential part of the safety regime but managing the inspection of such a wide range of different assets, each with different inspection requirements was a challenge. ESB originally used a manual system to keep track of assets and identify when items needed inspection so as to comply with workplace safety legislation. The system managed inspections and created the inspection certificates needed. This progressed to a PC based solution using Microsoft Access database which gave some improvements but suffered from the effort needed to enter data, problems in the use of different names for the same item and the difficulty of keeping databases synchronised across different locations. Because the system depended on asset numbers being typed in, it was open to error and identifying assets was time consuming. Items could be overlooked and, when equipment was moved from one vehicle to another, the history of individual items could be lost. ESB Networks were keen to improve their processes; providing ways of automating the inspection process, speeding up the identification of assets and finding ways of ensuring that equipment inspections were carried out in line with legislated requirements and to the appropriate standards. Developments in electronic asset identification offered ESB Networks a way of achieving this and, after exploring a number of possible solutions, the company selected the well-proven CheckedOK system developed by CoreRFID as the basis of the ESB Networks asset safety inspection and maintenance application. “Working with CoreRFID has given us a safety asset inspection system tailored to our business needs.” – James Treacy, Lifting Gear Supervisor, ESB Networks. ESB Network has a fleet of 2500 vehicles and each of these can hold 100 to 120 assets used in supporting lifting and climbing operations in support of the network. ESB Networks plan to eventually fit electronic tags to over 95,000 assets. These tags carry a unique number so that when the tag is read, the asset can be identified to the CheckedOK system. Tags come in a variety of forms and are compact and durable. 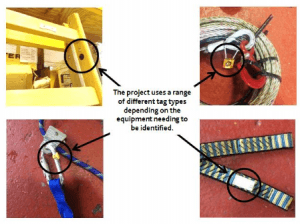 With equipment ranging from climbing harnesses and karabiners to ladders and other large assets, different types of tags and different ways of fixing tags were needed (screw/rivet, adhesive, zip tie and cable fix). CoreRFID worked with ESB Networks to develop the right tagging approach for each item and helped deliver the training that was provided to staff involved in the tagging process. ESB needed a tagging approach for each of their asset types. Initially, ESB planned to use one tag per asset but realised when planning the process that certain assets consisted of separately testable components, each requiring their own tag. ESB Networks engineers use Pidion BIP-6000 handheld computers to check the equipment on board a vehicle or at a site. A tag reader on the BIP-6000 is used to identify the electronic tags. The CheckedOK software prompts the engineers for the inspection tests relevant to the particular item and collects data about the results which are communicated to the central database. Because the system knows which tags should be found, any missing or duplicate items can be highlighted. The system can also indicate which items are due for inspection. If items fail to meet the inspection criteria, the engineer can schedule the item for repair or scrapping (a future enhancement will email these details automatically to ESB’s health and safety team). The system automatically generates the appropriate inspection certificates. These certificates, linked to the identity of the inspecting engineer, and the schedule of equipment for each vehicle, together with the equipment inspection history are available on-line through a web based portal to ESB staff and their authorised third party partners. This system helps ESB Networks to show compliance with safety equipment inspection legislation and to provide accountability for safe inspections. Among other features, CheckedOK helps ESB to standardise equipment naming and also provides one, networked, database of asset inspection data. The database shows information for equipment on every vehicle and at each site managed by ESB. A quick visual indication identifies, lifting, climbing and load securing items (which have different report requirements) and provides a link to the latest inspection certificate for that item. Details are also held of the last inspection, the asset’s current condition and any planned corrective action. Using the system, ESB Networks is better able to manage the assets used for its network maintenance and repairs services. It expects to be able to reduce the costs of lost equipment and to reduce asset management costs but most of all, the CheckedOK system will contribute to improving safety for staff, reducing the impact of accidents and saving costs in keeping the country’s electricity infrastructure operating. Much improved accuracy over manual systems. Less effort for asset & safety inspection management. Up to date reporting and automated certificate production. Better accountability for assets and safety inspection.